Skye (Scottish Gaelic An t-Eilean Sgitheanach), often referred to as the Isle of Skye, is the largest of the Inner Hebridean islands located off the west coast of Scotland. The capital and largest town on the island is the picturesque port of Portree. Armadale - linked to Mallaig on the mainland by ferry. Broadford - a village spread around a large bay looking onto the Inner Sound & across to the mainland, about 8 miles from the Skye Bridge. Carbost - home to the Talisker distillery and a very good beach. Elgol - small village with a boat service to Loch Coruisk and a walk to the fine beach at Camasunary. Glenbrittle - a good walking and climbing base. Isleornsay - a small village between Broadford and Armadale. It's a natural harbour with a hotel, a pub and an art gallery. Very quiet. Kyleakin - the original ferry landing from Kyle before the Skye Bridge was built, now a picturesque and peaceful fishing village with views of the harbour/loch/mountains & Castle Moil. Portnalong - end of the Minginish peninsular. Great craft fair weekly in the summer. Friendly pub with good food Good base for walking, climbing and photography. Portree - the attractive capital of the island. Sconser - location of the Isle of Skye Golf Club & ferry link to the Isle of Raasay, great views. Staffin - a district in the north-east and uninhabited offshore island. Uig - ferry link to the Outer Hebrides, great brewery, the Fairy Glen and close to the Skye Museum of Island Life. The Cuillin (Scottish Gaelic: An Cuilthionn or An Cuiltheann), Skye's best known mountain range ascending to 3,255 ft (992 m) at Sgùrr Alasdair. The Black Cuillin is perhaps the only range in the British Isles to approach in sheer, jagged rawness the mountain experience of such ranges as the Alps or Rockies. Inhabited since the Mesolithic era, there are currently about 10,000 people living on the island, although the transient population of tourists swells during the busy summer months. Skye's popularity with tourists is largely due to its remarkable landscape and easy accessibility from the mainland, both by car over the Skye Bridge or by ferry; and by bus and train through adjacent mainland towns. Skye is part of the Highland Council local government area and is now linked to the mainland by a road bridge. The island is renowned for its spectacular scenery, vibrant culture and heritage, and its abundant wildlife including the Golden Eagle, Red Deer and Salmon. It is also one of the most accessible regions in which to hear Gaelic being spoken, with about thirty percent of the local population being fluent and a sizeable Gaelic college in Sleat. Skye may be understood as a number of distinct peninsulas that extend out from the Cuillin, the mountainous centre of the island. A largely missable central plateau north of the Cuillin separates Portree on the east coast and Dunvegan in the west. Duirnish Peninsula includes Glendale, Colbost and the scenic lighthouse at Neist Point. Waternish Peninsula has some pretty villages, but is otherwise often overlooked by tourists. Trotternish Peninsula is the largest and most frequently visited, thanks in no small part to the stunning rock formations of the Old Man of Storr and the Quiraing. The A855 road (and 57A / 57C bus routes) circumnavigate this beautiful part of Skye, with plentiful options for walking and climbing, as well as numerous attractive small settlements for overnight stops or holiday bases. Minginish Peninsula offers amazing (but cloud dependent!) views south-east towards the Cuillin, as well as a scenic coastline. The Talisker Distillery (see 'Drink' below) is on the tranquil shore of Loch Harport in Colbost. Sleat is the gently rolling landscape that includes the southernmost tip of Skye and the pier at Armadale for the ferry to and from Mallaig. There are two main roads to Skye. The A87 travels west from the A82 (Glasgow - Fort William - Inverness) road at Invergarry (the A887 provides another connection to the A87 further north towards Inverness) to Uig, and reaches Skye over the bridge from Kyle of Lochalsh on the mainland to Kyleakin on Skye. The lesser used but equally scenic route is by the A830, the "Road to the Isles", from Fort William to Mallaig and thence by ferry to Armadale (see below). Now that the Skye Bridge is open (and free of charge since 2004), it is no longer essential to travel to Skye by boat, but it is still an enjoyable ride. The main route to the mainland is on the Caledonian MacBrayne (also known as "CalMac")  ferry between Mallaig and Armadale. The community owned Skye Ferry  also operates between Easter and mid-October seven days a week 10:00-18:00. 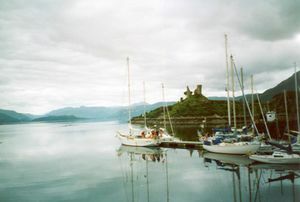 Sailings are every twenty minutes or as required between Glenelg and Kylerhea, accessible from the A87 on both the mainland and Skye via minor roads. From the Outer Hebrides, CalMac run to Uig in the north of Skye from Tarbert on Harris and Lochmaddy on North Uist. Many travellers bound for the Outer Hebrides will travel through Skye en route to Uig, usually on board the multiple daily Citylink  buses from Inverness, Fort William and Glasgow. A CalMac ferry also operates from Sconser on Skye to Inverarish on Raasay. There are two railway stations that serve Skye from the mainland, with the terminus of the West Highland Railway in Mallaig and the Kyle of Lochalsh Line terminating in its eponymous destination. ScotRail  trains travel along the West Highland Railway between Glasgow, Fort William and Mallaig, with convenient connections to the CalMac ferry to Armadale. Through tickets to Armadale can be bought at the ticket office, or on the train if boarding at an unmanned station. Between May and October, a restored vintage steam train hauls a rake of restored carriages on a daily return trip between Fort William and Mallaig. A second trip also operates between June and August. Fares are slightly higher than regular ScotRail services, but offer an additional connection. Tickets for this service can only be bought online from the West Coast Railways website  or from the guard on the train. Four or five ScotRail trains operate daily between Inverness and Kyle of Lochalsh, with onward bus connections to Skye. Connections with overnight sleeper trains from London Euston are possible six nights a week in Glasgow, Fort William and Inverness. There is also a daily 'Highland Chieftan' intercity train from London King's Cross to Inverness. For train times and fares contact ScotRail  or National Rail . Services 915 and 916 run from Glasgow to Uig and/or Portree via Loch Lomond, Crianlarich, Tyndrum, Glen Coe, Fort William and Kyle of Lochalsh. The journey takes up to 8 hours. Service 917 runs from Inverness to Portree via Loch Ness and Kyle of Lochalsh, with the journey taking up to 3 hours 30 minutes. If bought on the day, a ticket from Glasgow to Uig costs around £40 each way. Limited numbers of discounted advance purchase tickets are available online  - it is possible to obtain a ticket from Glasgow to Skye for £5 if booked in advance. It is advisable to book a ticket in advance during the summer or around holidays. Local buses connect Armadale pier (for the ferry to/from Mallaig) with Broadford and Portree several times a day (fewer in the winter). Local buses also run over the Skye Bridge between Kyleakin and Kyle of Lochalsh. Fares rise by distance travelled, with a half-hour journey usually costing around £3. The only remaining special ticket of interest to tourists is the £8.50 Day Rider, which will normally make sense if you are using more than two buses in one day (although drivers will normally advise you if it is cheaper to buy that or singles). Although they are listed alongside local buses in journey planners and at bus stops, passengers should avoid taking Scottish Citylink coaches for local journeys within Skye or across the bridge to Kyle of Lochalsh; fares are substantially cheaper on local services and the Day Rider is not valid on the Citylink buses. That being said, Citylink buses operate the most direct service from north to south and vice versa. As a guide, a return ticket from Kyle of Lochalsh to Sconser costs £6 as of 2013. An area guide for Skye and Lochalsh lists all bus times, and is issued twice annually for winter and summer seasons. It can be downloaded in pdf format from Stagecoach Highlands by clicking on 'Timetables' and then scrolling down to 'Skye and Lochalsh' or picked up in paper form from buses and tourist information centres. It is strongly recommended to check times in advance, paying special attention to any timetable notes relating to days when the bus runs or does not. Many buses listed above only run on schooldays; in addition none of the local buses operate on Sundays outwith the summer season. The Citylink services, on the other hand, operate on Sundays year-round. In addition to Stagecoach services on the island, Uig Taxis operates a taxibus service between Portree and the Trotternish Peninsula - this service connects with the 1500 Citylink service from Glasgow. Timetables for the taxibus can be found on the Citylink website in the Glasgow - Fort William - Skye timetable. Although substantial European and Scottish funding has been made available to improve and widen certain key routes (most recently the southern section of the Armadale to Broadford road), major roads are still quite narrow and can get congested in high season. However in low season driving in Skye is a delight with only the occasional sheep wandering onto the tarmac to concern you. On narrow single track rural roads pay attention to passing places and drive courteously, being ready to pull over to allow an oncoming vehicle to pass. Car hire is available in Portree and Kyle of Lochalsh, but can be expensive. When travelling to the island in the high season, call ahead for availability. Many of the roads in Skye make for good cycling, although traffic can be a problem in late summer. If you're cycling, make sure you have good raingear; Skye is wet even by the drizzly standards of Scotland. The ferry from Mallaig accepts bicycles, and the ride from Armadale north to the bridge is pleasant. Hitching is never one hundred percent safe, but residents of Skye are generally very open to giving rides in remoter areas (especially if you've missed the last bus of the day or it's raining). 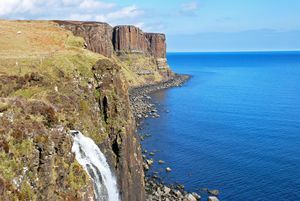 Trotternish Peninsula, including The Old Man of Storr and The Quirang has a beautiful coastline with numerous viewpoints and the many interesting rock formations of the Trotternish Ridge. A minor road follows its coast from Staffin to Uig and offers some of the best scenery on Skye. Old Man of Storr - one of the famous sights. Expect a 2-3 hour walk, from the car park to the Old man and back down. The Quirang is an area of dramatic rock towers and ridges. You get great views even from the car park but to fully explore it set aside 3-4 hours. Dunvegan Castle & Gardens,  is the oldest continuously inhabited castle in Scotland and has been the ancestral home of the Chiefs of Clan MacLeod for 800 years. Experience an extraordinary castle and Highland estate steeped in history and clan legend, delight in the beauty of its formal gardens, take an exhilarating boat trip to see the seal colony, enjoy a meal at the MacLeods Table Cafe or browse in one of its four shops. The Clan Donald Centre  at Armadale is set on a large estate and preserves the ancestral home of the MacDonalds at Armadale Castle. Facilities open to the visitor include the castle grounds (attractive gardens), several hiking trails, and a new museum, the Museum of the Isles, covering the history of the area (extending back as much as 1500 years). The grounds and museum are open during the summer 7 days, 9:30-5:30; the grounds are open for outdoor visits year-round, while hours at the museum during the fall are Wednesdays only, 11-3, and it is apparently closed during the winter months. Admission £4.90 for adults, £14.00 for families; admission covers both grounds and museum. Kilt Rock and Waterfall On the A855, about 2 miles south of Staffin, you can see a cliff that bears an amazing resemblance to a kilt, complete with tartan-like pattern. There is a good parking place and you can photograph both Kilt Rock and a small stream from Loch Mealt falling off the cliff into the sea. An Corran near Staffin is known for its fossilized footprints of dinosaurs living there 160 million years ago. They can be seen at low tide. MacLeod's Maidens - Skye's magnificent coast off the Dunvegan road is often forgotten in the allure of the Cuillin. The UK's highest cliffs are to be found here. The 'Maidens' are very striking sea stacks and give a target for a walk. Neist Point Lighthouse marks the westernmost point of Skye. 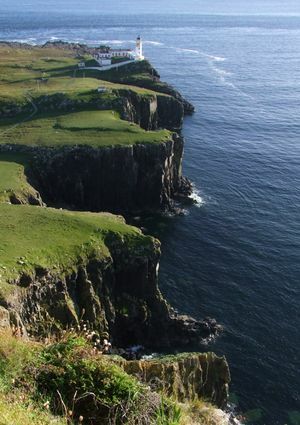 It is located on top of a stack of cliffs and offers wonderful views across the Minch over to the Outer Hebrides and is also a good place for spotting whales, dolphins and other wildlife. To get there head south from Dunvegan and turn west onto B884 towards Colbost and Glendale. The drive should take about 45minutes and it is then a short (but steep) walk to the lighthouse. Fairy Glen is a hidden but absolutely lovely small valley of cone-shaped hills with ambience that truly lives up to its name. It is on a very minor road branching off A87 just south of Uig and well worth the short detour. Please note it is not signposted so check directions before you go and watch out for the sharp uphill turn. Flora & Fauna - The fauna of Skye knows a great diversity as birds of prey like golden eagles, buzzards and hen harriers. On the coastline you will find rare sea eagles, shags and cormorants. The magnificent red deer and a great diversity of smaller animals like roe deer, the red fox or the weasel. Even smaller the rarely seen adder but also toads, frogs, lizards and insects as dragonflies, butterflies, slugs & caterpillars. Grey or common seals and otters can be seen on the shores and you may be lucky to observe porpoises, dolphins or even whales offshore. Visit Isle of Skye walks, a free and independent on-line guide to walks on the island. Skye Live is a mid-June event featuring popular music with both regional and international entries. Go walking in the Cuillins, Skye's most famous group of mountains. Be warned that there are no natural sources of water on the ridge (except for winter snows and melt water): all water must be carried by the visitor. Walk/climb the Quiraing a landslip on the eastern face of Meall na Suiramach, the northernmost summit of the Trotternish Ridge. 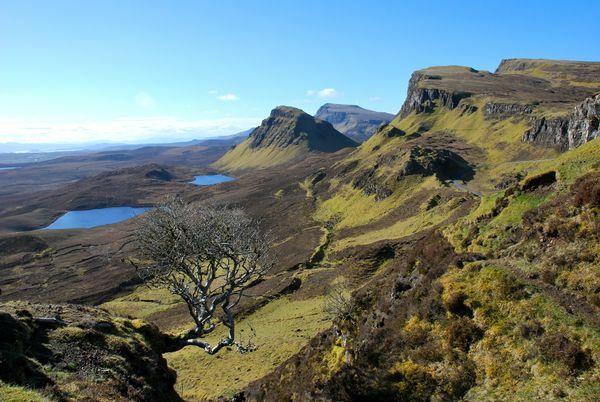 You can walk around the Quiraing following a quite easy path, 4 miles (7 km) in about 4 hours. Quiraing (Scotish Gaelic: Cuith-Raing) comes from Old Norse Kvi Rand, which means Round Fold. For the less adventurous, there are boat tours of the Cullins during the summer months leaving from the remote village of Elgol. The views are stunning and you'll get to see some seals too. Learn Scottish Gaelic at Sabhal Mòr Ostaig, Skye's famous Gaelic college. Attend one of their short courses or do a full degree. Go to the Skye Silver shop in the north. Woollen goods are a noted product of Skye. Look for them at the gift shop at the Clan Donald Centre (above) or in Portree or Armadale. Co-Operative Woodlands Road (on the A87 out of Skye towards Uig) tel: 01478 612483. Portree's only large supermarket is - luckily - one of this large chain with a wide range, including excellent organic, fairtrade and ethically sourced produce. There is also a Co-op in Broadford, with a 'Gulf' petrol station attatched to it. Portree Butchers Wentworth Street, tel: 01478 612551. The Waverley Restaurant opposite the Kyle Hotel, Kyle of Lochalsh, tel:01599 534337 , specialises in home cooked highland fare. A favourite with the locals! The Waterside Restaurant train station platform, Kyle of Lochalsh, tel:01599 524813, specialises in simple, fresh seafood. The Taste of India Kyleakin, tel:01599 534134, traditional Indian cuisine. Very popular with the locals. Red Skye Restaurant Breakish, near Broadford, tel:01471 822180 , specialises in home cooked highland fare. A favourite with locals! Creelers Seafood Restaurant Broadford, tel:01471 822281 , French country dishes alongside Cajun style seafood. Shores Restaurant Plockton, tel:01599 544263 , a favourite with locals! Café Arriba Quay Brae, Portree (overlooking the harbour). Tel: 01478 611830  A must for any visit to Portree. Broad and constantly changing menu of Mediterranean style snacks and meals, with good coffee and plentiful vegetarian choices. Also the perfect spot to sit out a rain shower, with views over the harbour. Lower Deck Restaurant on the harbour in Portree, tel:01478-613611 specialises in simple, fresh seafood dishes, e.g. fish and chips £7.50. The Old Inn Carbost. tel 01478 640205. Adjacent to the bunkhouse and B&B of the same name, take caution from guidebooks that report superb meals and snacks: the professional chef is only employed during the summer season so expect pretty average pub grub between autumn and Easter. The Uig Hotel Uig. tel 01470 542206 http://uighotel.com Specializes in local sourced cuisine at an average price. Menu consists of lots of fresh seafood. Lovely view of Uig harbour. A must visit! Munros Bar - Taigh Ailean Hotel Locally sourced food in a super friendly pub - watch out for the barman's very dry sense of humour! The bar is open 6-11 in Spring and Summer but look on the website to make sure (www.taighailean.scot) at other times. Winter menu is more bar food (fish and chips, scampi and chips etc). Takeaway is available all year, useful if you're staying in the bunkhouses or camping. Flodigarry Country House Hotel tel:01470-552203  was apparently once very good, but now past it: food is unimaginative, overcooked, and poor value at £36/head for three courses and coffee. The Old School House Dunvegan, tel. 01470 521421. Perhaps the greatest surprise to be found in Dunvegan: behind a modest facade sits one of Skye's finest restaurants, with a small but confident and ever changing menu of superb dishes. Much of the meat and fish is locally sourced, although vegetarians should expect no more than one or two main courses to choose from. Mains from £9 - £20. The Three Chimneys Colbost, Dunvegan, tel: 01470 511258 fax: 01470 511358 email:[email protected]  was voted one of the 50 Top World Restaurants by "Restaurant" magazine. Book well ahead! Cuillin Brewery tel: 01478 650204  Easily found adjacent to the Sligachan Hotel & Restaurant, at the junction of the A87 Broadford - Portree Road and the A863 to Dunvegan. Micro-brewery that also offers tours. Isle of Skye Brewing Company in Uig tel: 01470 542477  Brewery tours and a shop open from Easter to mid-October. The breweries most popular bottled beers Black Cuillin (a dark porter), Red Cuillin (an amber) and Hebridean Gold (a golden ale) are available in most pubs throughout the island. Talisker Distillery tel: 01478 614300‎  On the shores of Loch Harport in Carbost, on the west coast of Skye (and not in the village of Talisker itself) Talisker is Skye's only distillery. Producing a hefty, aromatic and distinctly peaty whisky that is similar to those from Islay. Tours of the distillery are offered at intervals throughout the day by friendly and informative guides. Reservations recommended, especially during the summer. Tickets £5 with including a £3 discount in the shop at the end of the tour. Note that Isle of Skye  is a blended whisky produced near Edinburgh, with no extant connection to the island. Basement Bar beneath the Dunvegan Hotel, Dunvegan. tel: 01470 521497  A spacious pub with several pool tables and views across the water to Macleod's Tables, usually quite spectacular at sunset. Note also the more refined surroundings of the lounge bar in the hotel upstairs. The Old Inn Carbost. tel 01478 640205. Note the words of caution with regard to the menu above, but this is a friendly and cosy pub that - while busy with tourists during the summer - is a charming local during the winter with a stunning view along Loch Harport from the patio. Pier Hotel Portree Harbour 01478 612094‎. A haven from the tourist crowds, the tiny bar of the Pier Hotel is predominantly frequented by locals. Visitors should expect to be part of the conversation the moment they enter the bar. Skye's busiest tourist season is from Easter until the end of September, when accommodation usually requires reservations and when some prices rise. Some places close during the winter. Portree Independent Hostel, +44 1478 613737  is where you're most likely to end up staying if on a budget in Portree. Formerly the town's post office, the unmissable bright yellow building is just off the town's main square (where all local and long distance buses stop). Small lounge, drying room and large well equipped kitchen / dining room. £17 per person per night. Sabhal Mòr Ostaig Halls of Residence, 01471 888000 near Armadale in Sleat. Stay at Skye's famous Gaelic College, Sabhal Mòr Ostaig. Bed and breakfast; individual en-suite rooms and good breakfast. Book the penthouse in the tower for the most spectacular views. Evening meals available too (check serving times) Visit Sabhal Mòr Ostaig . Broadford Hostel 01471 822442 or 08701 553255. Perhaps Skye's least attractive hostel, but conveniently located in this practical town, an ideal base for exploring. Glenbrittle Hostel 01478 640278 or 08701 553255. The remotest of Skye's hostels, some distance from the nearest bus but accessible on foot, bicycle or by car. Portree Hostel 01478 612 231. Opened in March 2015 in central Portree. Raasay Hostel 01478 660240 or 08701 553255. Open from May to September. The Cowshed Boutique Bunkhouse, 07917 536 820  Located at the former SYHA hostel in Uig. Dunvegan Hotel Bunkhouse, 01470 521497  Two small rooms with bunks adjacent to the Dunvegan Hotel (see below). Linen provided, small bathroom but no kitchen facilities. £12.50 per person per night. The Old Inn Carbost, 01478 640205  Five multiple occupancy bunk rooms in this excellent hostel, recently built overlooking Loch Harport in the small town that is also home to the Talisker Distillery. Large kitchen / lounge upstairs with balcony and views up and down the loch. Adjacent to the Old Inn for food and drinks. £14 / £16 en suite. Bed & breakfast accommodation (£37 / £42) and self catering family chalet (£110 per night) also available. Flora Macdonald Hostel 01471 844272  Located a couple of miles from the pier at Armadale (with a free pick-up from the ferry available with advance notice) this modest hostel has a number of self catering rooms in its main building and newer lodge. Tranquil setting but with no local amenities accessible on foot, so bring supplies. £15 per person per night. Very popular with visitors to Skye, and there are numerous camp sites dotted around the island, some in extremely picturesque settings. There will no be a better place to camp than on the Quiraing itself. Imagine wild camping there, sitting in your tent with a nice hot brew and admiring this magical landscape at sunset, or even better, waking up at sunrise! Torvaig Campsite, Portree, IV51 9HU ☎ +44 1478 611849 - This camp site within walking distance of Portree is well maintained and very clean. Most B&Bs are run by the owners and are often a more economical option to hotel accommodation. White Heather Hotel, 01599 534577  Small & friendly, family run hotel, B&B £37 pppn. Views onto Loch Alsh, Kyleakin harbour & Castle Moil. Kinloch Lodge Located at Sleat, tel: 01471 833214  cozy, seven room lodge for when you need to get away from it all. Clan Donald Centre includes a limited number of cottages; see link above under "See". Glenview Hotel, 01470 562248  offers comfortable accommodation just ten minutes from the Old Man of Storr. Dunvegan Hotel, 01470 521497  Small family run hotel in the quiet town of Dunvegan. Lounge bar and restaurant and pub downstairs. Stunning views (especially at sunset) west towards the Macleod Tables. £80 / £90 a night (more expensive with a view). Sligachan Hotel, 01478 650204  is a famous gathering place for climbers and walkers. Pricey (£90 and up for twin room with breakfast, at least during peak season), but you can't beat the location. There is also a bunkhouse. Duntulm Castle Hotel, 01470 552213  is near the ruins of Castle Duntulm north of Portree. A 19th-century shooting lodge in an attractive setting. Walking the Quiraing is not that tough but be sure to wear good walking shoes and proper rain clothes. When preparing for this walk, Walkhighlands will be a great help. Some may think that the greatest annoyance, especially from the beginning of June until the end of September, is the ferocious "Midge". This site maps midge levels across Scotland. The four Small Isles of Eigg, Rum, Muck and Canna are accessible by CalMac  ferry from Mallaig on the mainland, although note that during the winter service is limited and that throughout the year the daily timetable changes, so overnight trips are often necessary. A great deal of beautiful and historic country is on the Scottish "mainland" side of the Skye Bridge, beyond Kyle of Lochalsh. Eilean Donan Castle is near the tiny village of Dornie, not far beyond Kyle of Lochalsh, and is well worth a visit. CalMac  ferries connect Uig to Lochmaddy on North Uist and Tarbert on Harris.